BBQ foods are hearty, fulfilling, and leave a satisfying knot in your stomach that defy hunger pangs until your next meal. I humbly submit that it’s as sophisticated as any culinary craft can be and it’s genuine gastronomic art in the eyes of the beholder. Since September is my designated Bacon Month (see previous week’s post), I’m up living up to my calling to create something with bacon that’s suffused with the character and tradition of true American BBQ. 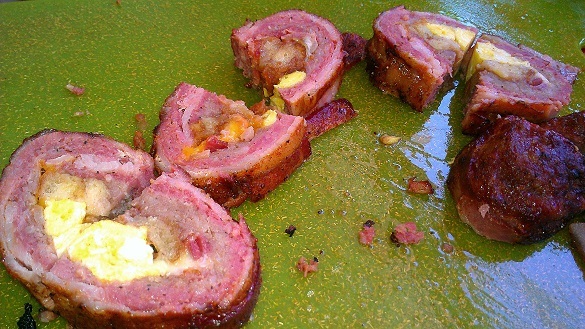 There are countless ways to make a BBQ Fatty which is essentially a flavorful sausage wrapped around anything you fancy eating from pork loin to shrimp to polenta. It’s easy to prepare and you and your guests will be filled with tasteful satisfaction of this heart-attack-on-a-plate. If you’re going to go, best to go happy . . . BBQ allows me to affirm my soul and the preciousness of simple things in life. It’s a celebration of my survival of another busy week at work trying to oversee project managers that build the IT infrastructure of datacenters, networks, microwave system, servers, workstations, and devices that bring water to 18 million persons across 300 cities and 5,000 square miles. It’s a rite of renewal and a triumph of the daily abrasions from the demands of a job, the Dogbert bureaucracy, and being the first in line for the rolled up newspaper when things don’t go right. You can tell it’s been a tough workweek for me as I unwind by writing this article and shift my focus from the world of IT into the world of smoke, fire, and meat. For animals, eating is survival. For me, eating is a rite of renewal and great art that I’m going to make accessible to you with some imagination and helpful hints. I’ve done some mundane and some imaginative (read, strange) bacon fatty concoctions so this one is pretty tame. I wanted something to perk up my students in my Saturday BBQ class so I scoured my freezer and found some bacon and leftover frozen Apple Fritter donuts. 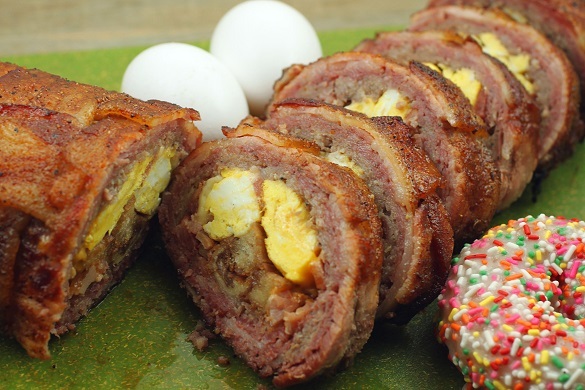 I found some eggs and some ground pork so I decided to make a Bacon Weave Breakfast Fatty. Regular ground pork is fine but the best sausage comes from boneless shoulder hand ground by your butcher. If you’re too busy, regular store bought breakfast sausage is fine. Charcuterie tip: Scoop 1 teaspoon of the sausage you made and cook on a hot saucepan. Taste and then adjust the seasonings to your liking. Make a bacon weave by laying out 8 strips of bacon and weaving the other 6 pieces into a bacon weave fabric. 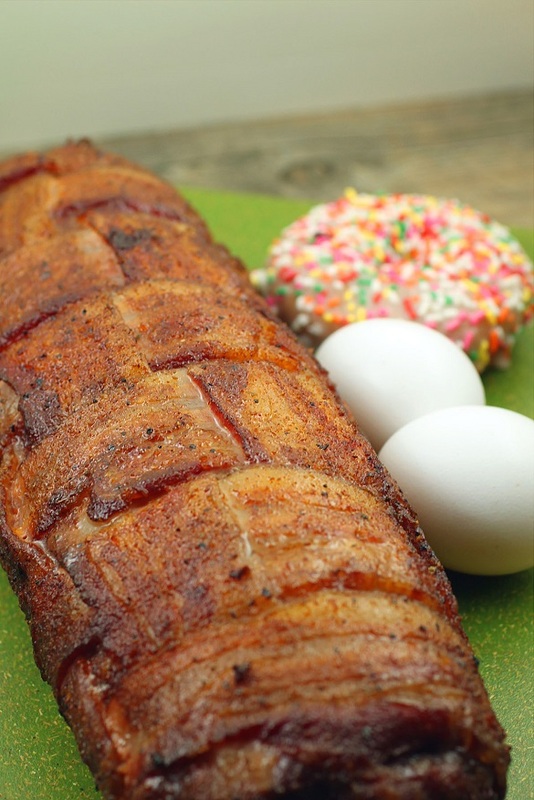 Lay out 8 strips of bacon (#1 to #8) parallel to each other on a sheet of foil or parchment paper. Weave the 9th strip 90 degrees to #1 – #8. It’s easy if you start from left to right and lift each of the #1 to #8 strips as you lay down the 9th, 10th, 11th, 12th, 13th, and 14th strip. Smoke in 275 degree smoker until internal is 165, about 45 minutes. Remove and sauce with your favorite BBQ sauce Your doctor would not approve but your taste buds will!